LinkedIn: An Executive Recruitment Game Changer? 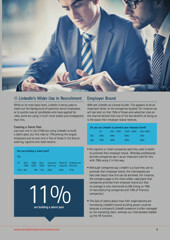 - Norrie Johnston Recruitment Ltd.
LinkedIn: An Executive Recruitment Game Changer? A third of the world’s executive talent is now registered on LinkedIn. Is this phenomenal growth spawning an era of DIY executive recruitment? This free, downloadable, research based report answers this question. It gives an invaluable insight into how 100 major UK organisations are using LinkedIn in the executive recruitment process. This includes some of the shortcomings limiting the channel’s role, how other social channels are used and even how HR heads assess a LinkedIn profile.